The Information and Communication Technology (ICT) sector consisted of 2,511 businesses with 21,343 workplaces in the Basque Country in 2015, 2.1% of employed individuals in the Basque economy according to Eustat data. Furthermore, it generated 2.4% of total value added (1,505.5 million), and posted a turnover figure of 3,381.4 million euros. Compared with the previous tax year, although the main variables of the sector performed positively, the sector made up less of the economy as a whole, which grew at the same rate in 2015 that the ICT sector did, both in terms of personnel and in value added. In 2015 the number of employed individuals increased by 1.4% (297 more) and the number of establishments by 1.7% (42 more), maintaining the average size of 8.5 individuals per establishment, all compared to the previous year. The turnover figure also grew by 2.9% and the value added by 0.6%. However, in relation to the economy as whole, its contribution dropped one tenth in terms of both employment and value added. 6.9% of companies in the ICT sector carried out R&D activities, a percentage that is far higher than the 1.0% of the total for all sectors. Furthermore, this sector, which represented just 1.6% of companies, accounted for 10.9% of those carrying out R&D and, with 68.4 million euros, it spent 7.2% of total expenditure on internal R&D in the business sector. This means that the proportion of total expenditure on this sector increased from 2014 by 0.2%. With regards to people working in R&D in this sector, the figure for people in full-time work in 2015 stood at 1,304 (325 of whom were women), and 10.0% of these positions were provided by the business sector in R&D, or 7.2% if we take into account the positions provided by all the sectors. Regarding innovation, as with R&D, there were significant differences between the total for all sectors and that for the ICT sector. In 2015, 28.7% of establishments in the ICT sector were innovators compared to 11.9% of the total for all sectors. If company size is taken into account, those with 10 or more employees recorded percentages of 52.0% in the first case and 28.2% for the total number of sectors. Regarding expenditure on innovation, ICT establishments contributed 173.6 million euros, 7.1% of total company expenditure. Of this expenditure, 154.8 million corresponded to establishments of 10 or more employees, which was 7.4% of the total spent by companies of this size. The ICT sector also allocated a greater proportion of resources towards R&D&I than the other sectors, and it is worth noting the figures spent both on innovation and on R&D with regards to the turnover figure (innovation and internal R&D intensity ratios). 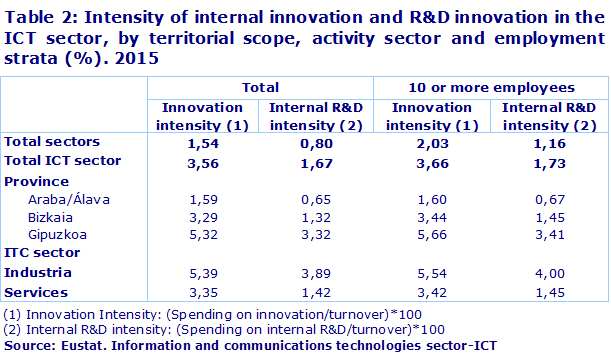 Specifically, innovation intensity in this sector was 3.6 compared to 1.5 over the economic sectors as a whole. 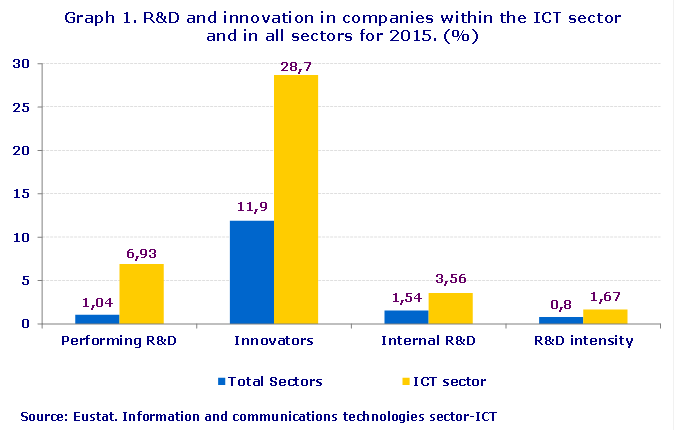 In the case of internal R&D, the ratio was 1.7 for the ICT sector and 0.8 for the economy as a whole. As the use of ICT technology is extremely commonplace amongst the companies in this sector, e-commerce, although more developed than in the other sectors, continued to have a modest implementation, above all in terms of sales. The establishments that made purchases via this method in the ICT sector accounted for 67.5% and those that carried out sales accounted for 16.5%, compared to 23.9% and 6.5% respectively for the total of all sectors. Hence, 68.3% of ICT establishments engage in e-commerce, whereas it represents 26.4% of the total of all sectors. 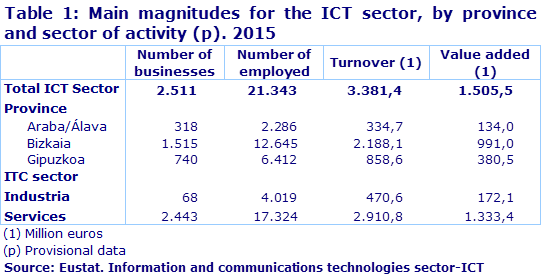 On the other hand, the impact of the ICT sector on the foreign trade of goods was not very significant. Whilst exports accounted for 293.7 million euros out of a total of 21,867.8 million, imports stood at 402.0 million out of the 16,835.6 million of total imports, accounting for 1.3% and 2.4% respectively. 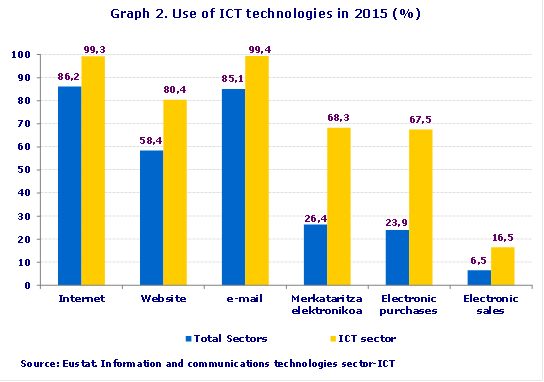 The most common products traded in terms of exports were Electronic Components, 41.5%, and Other ICT Products, 30.4%. In terms of imports, the most common products were, once again, Other ICT Products, 33.6%, Telecommunications Equipment, 23.4% and Electronic Components, 21.5%. Lastly, if we compare ICT sector data for the Basque Country with Spain as a whole in companies with 10 or more employees, differences can be seen in the indicators observed. Whilst the percentage of innovating companies, innovation intensity, web sites and broadband was higher in the Basque Country, the percentage of companies engaging in e-commerce was higher in Spain as a whole.